Oh, and there’s no Worst film this week, as the Top 5… Movies I Should Like Less is an entirely different list, that’ll probably be dropping by next week, so stay tuned. I recently listened to an episode of the LAMBcast in which this was their Movie of the Month. I’ve never really considered it to be as much of a classic as everyone else seems to, but I realised it’s because I’ve never properly watched it. I’ve sat through it a few times, always on my own, but I’ve always been doing something else simultaneously (a method I’ve unforgivably used to ruin an awful lot of the first viewings of amazing films, such as Alien, Fight Club and countless others), and I think I always fall asleep about 10 minutes before the end. I couldn’t remember many of the things discussed in the cast, so this is only at number 5 on the list, as clearly I haven’t paid it enough attention. All being well, when I come to cross Ridley Scott’s dystopian replicant-hunting sci-fi off The List, it’ll no longer be worthy of a place here. Watch this space. I really like The Thin Red Line, the only other Terrence Malick film I’ve seen so far (Days of Heaven is also on the List, and it’s likely that The Tree of Life will be next year), and had heard a lot about Badlands, Malick’s first film, before watching. Martin Sheen is a legend from the likes of Apocalypse Now and The West Wing, so I was eager to see him in an early performance as a cocksure killer on the run, so this could be a case of overly high expectations going in when I eventually came to cross the film off the List. As it turned out, I found the film disappointing (a feeling I’m becoming more and more familiar with the further I get through the List), with an irritatingly vague narration. 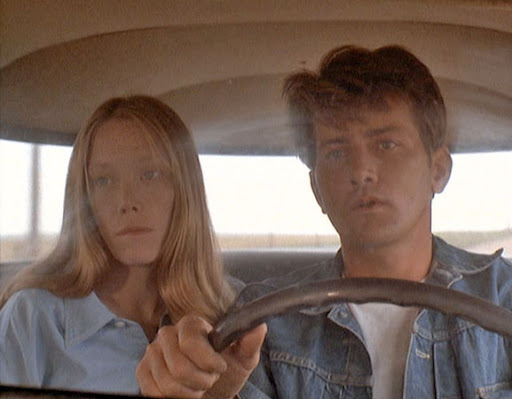 I get that Sissy Spacek’s Holly is supposed to be childish and naive, but that doesn’t mean it won’t annoy me, and though she and Sheen give good early performances and the visuals are generally stunning (assisted by Malick’s love affair with sunsets) this is up there with Easy Rider as a supposed classic that I just don’t get. The Incredibles is a Pixar film that doesn’t star talking vehicles, so I love it. My issue is though, that everyone else seems to love it more than me. Whenever I hear people discussing their favourite Pixar movies, animated movies or just movies in general, this invariably crops up, yet I’ve always deemed it a lesser movie in their cannon. When I did a little Pixar day last year, the story of a family of retired superheroes was awarded a paltry 8/10, as opposed to the 9 and 10 given to Ratatouille and Wall-E. And for the life of me, I can’t understand why. Maybe it’s because the lists that include this amongst the greatest tend to be from America, where I feel the superhero subsect is a greater part of the general culture, with afternoon TV shows devoted to them that I never saw. Perhaps the tale of a bored office worker getting the chance to re-live the action of his youth hits home more with a slightly older generation (though I empathise more with this every day)? For whatever reason, this has always been my 3rd least favourite of Pixar’s films, above Cars and Cars 2 (which I’ve yet to see). This is one of the finest examples of a film suffering from so much hype before I saw it, that it had no hope whatsoever of meeting my expectations. I didn’t see The Goonies until I was 18 and in my first year of university. I’d heard for many years what a classic it was, how much it had meant to my friends growing up and how their perfect idea of a night in was this and a big bowl of popcorn, so understandably I was expecting a good film, but instead I was treated to a bunch of annoying kids who refused to shut up as they set out on a treasure hunt. 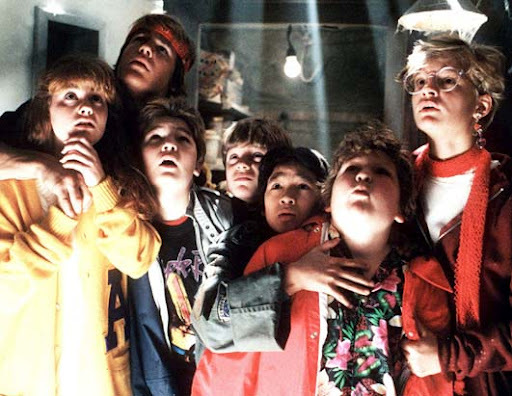 My own personal theory, after discussing this with a few others who share my feelings for the film, is that The Goonies is best watched before you reach the age of 15, preferably with friends of the same age. Do this, and you’ll love it, but watch it a day too late and it’s a phenomenon that’ll have just passed you by, never to return. Also, I was never exactly a small kid, so the hardships endured by Chunk brought back a few too many memories. Hang on, hang on, hang on, don’t lynch me just yet. I love this film. It’s got everything; a great cast, awesome direction, interesting narrative structure, and it’s bloody entertaining with one of the most quotable scripts ever. So why is it here? Well, this is a personal thing. The first time I watched this film was when a friend of mine (he shall remain nameless, but he knows who he his, and he probably doesn’t read this, mainly because I question his ability to read). Said friend believed that, instead of showing me the film in Tarantino’s opted chopped-up order, he would re-order it himself, by skipping or back-tracking through scenes on the remote. You might be thinking, and would be forgiven for doing so, that he put it into chronological order. This would make a certain kind of sense, but is still a stupid thing to do, but no, he didn’t. He put the scenes into his own insane order, skipping some entirely. I think Harvey Keitel’s Wolf only got a brief look-in, and his strand is arguably the most entertaining. And so it is that whenever I now watch this film, which is far less often than I’d like, I am constantly reminded of the unspeakable crime done to me by this friend. This entry was posted in Top 5 and tagged Badlands, Blade Runner, Pulp Fiction, The Goonies, The Incredibles by jaycluitt. Bookmark the permalink. I'm with you on Blade Runner. I saw it for the first time a couple of years ago and because of the hype I was expecting to be blown away. In the end I found it a bit boring but keep meaning to go back and see if I was wrong.I also saw the Goonies for the first time a couple of months ago and thought it was so-so. A bit of fun but nothing more. Nice post. Thanks. 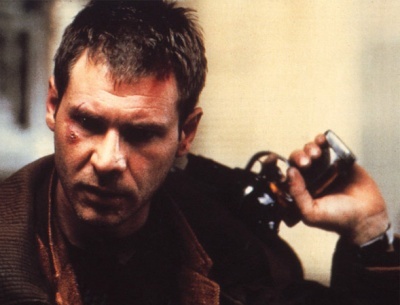 Some friends of mine absolutely love Blade Runner, up to a point where I don't think they want to ever watch it with me in case I don't like it and further ruin their enjoyment of the movie, so I guess I'll have to watch it again on my own. I love your #1 pick here. 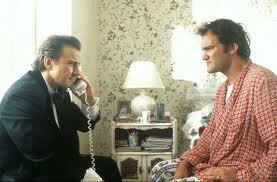 When Pulp Fiction came out, I loved it, and loved Tarantino. Now, as the film ages, I like it less and less each time I see it. Yes, it's still a good, even great movie, but the cracks are really starting to show. I haven't seen it in a while, but I know what you mean. Fortunately Tarantino has made a film arguably just as good recently in Inglourious Basterds, and my hopes are high for Django Unchained, so it's not too bad if one classic starts to crack, as long as he makes something else to replace it. I agree on Blade Runner and on Goonies. I saw Blade Runner originally and it didn't impress me much because it was a basic staple story from science fiction, which I read a lot of. I kept hearing how much critics loved the movie that in the late 80s I finally watched it again and still wasn't impressed. Then a director's cut came out and suddenly people could say enough bad things about the voice over in the theatrical version that before was getting so much praise. I watched this "improved" version and still wasn't very impressed. Note – I don't dislike the film; I just don't think it's either original or that great.As for The Goonies, I liked it well enough, but I think it's the kind of film you've got to fall in love with as a kid and I was too old when it came out. Cannot agree more on the Goonies. I'm not even sure which version of Blade Runner I've seen, but I think it's the Director's Cut. It's just one of those films that some people love so much that now newcomers can't enjoy it as it'll never live up to expectations, which I think Star Wars suffers from as well. You're right oo about it not being an overly original story, and I was never that bothered about whether Deckard is a replicant or not. After watching the film I just assumed he wasn't, and left it at that. It's like Inception (Spoiler alert) I just assumed the spinner fell at the end, and thought no more about it. I was surprised to see Goonies and the Incredibles on this list, but I totally understand your reasons. As a superhero fan, the Incredibles does a lot of things that no other superhero movie does, and yet it does them the right way. But if you're not too familiar with superheroes in general, then I can see how it loses some of its luster. And FYI, you got my Lamb nomination for best running feature, love your top 5s. Well I've only watched the Goonies once, and it does appear on the List so when I get around to it I'll try and go in with an open mind. 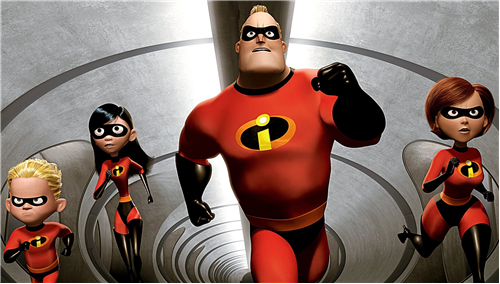 The Incredibles would probably make it into my top 200 films (maybe even less than that, not sure), it's just that everyone else seems to enjoy it much more than I do.Thanks very much for the nomination! I haven't submitted mine yet, but I'm sure you'll be on there! I pretty much agree with you guys on both movies. I didn't like Blade Runner and although I absolutely love Goonies it is true that most of the affection comes from childhood memories. Nice point on Star Wars too, especially if the newcomers start by seeing the prequels first. I (ashamedly) started Star Wars with the prequels, which is why I don't hate them as much as everyone else seems to. Thanks for reading.